Last day of the alphabet themes at the Month of Holiday Cards at Beccy's Place. That means today has to use the letter "Z" and what's a better Z than at the Zoo? I thought Milton, the Giraffe, was a perfect Zoo animal and here he is, dressed in all his Christmas finery! I started with the sketch from Viva la Verve. horizontal strip. It was a scrap from a Bo Bunny pad. He's pre-colored but the sky and ground are colored with ProMarkers. It's amazing how much depth is added to an image when you color in a background. I die cut him with a tall, skinny, rectangle die (QuicKutz) and added a dark green mat, also die cut. I used the smallest dies from that set to cut the sentiment and the mat for it. The lightly striped background paper was in my stash. I chose sparkly, metallic ribbon, wrapped it around the card front and tied a quadruple loop bow with the help of my bow maker. That is so wonderful that you donate cards to a Senior Center. I love Milton the giraffe too. Beautiful card Connie, love the image and design! Thank you for sharing with us over at Star Stampz! We hope to see you again! So cute!! 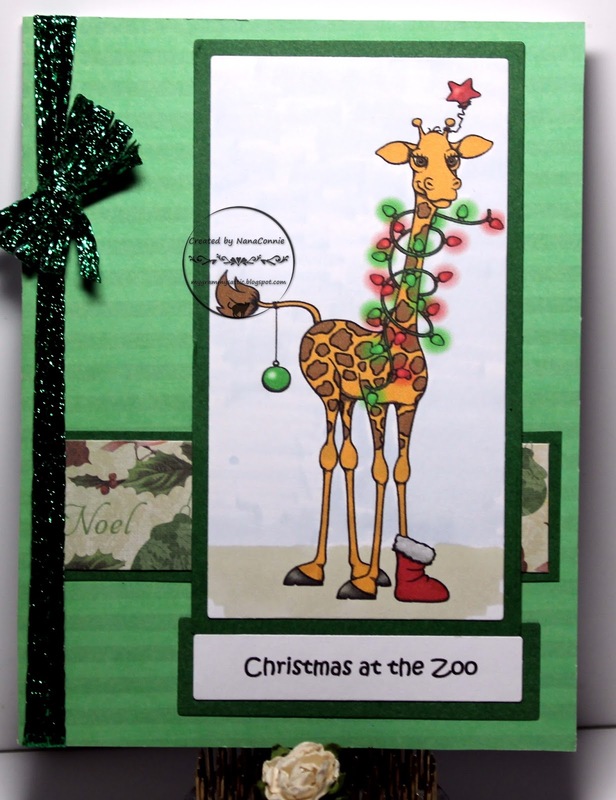 I don't think I've ever seen a Christmas giraffe before; this one is so fun! Love that sparkly ribbon. And what a great idea to donate your cards to the Senior Center; I'm sure they appreciate it so much! Thanks for playing with The House That Stamps Built. Donating your cards to the Senior Centre is a lovely idea NC, and by the sound of it, one they appreciate very much. I love your take on the "Z" prompt... there are some years when Christmas morning really does seem like a zoo! I'm sure anyone with a big family can relate. Great take on the sketch and great choice of papers. Well done. I didn't think of zoo, Connie, but that's brilliant! I love the Merle image and that he's all wrapped up in lights! Great job this month. And how nice that you donate so many cards! Love that sweet giraffe all tangled up in the Christmas lights, reminds me of when I put lights on our tree! What a fun sketch and I love your interpretation of it! Love this gorgeous card and that giraffe is wonderful. Just to say that I have thoroughly enjoyed your alphabet Christmas! Very inspirational! Oh, what a fun card. That giraffe is just too cool. So glad you could join us for Viva la Verve! OMG! I love your card, that giraffe is adorable!. Thank you for participate with us in Polkadoodles Challenge blog. Love it, NC - those lights round the giraffe look great! Super cute project! Thank you for sharing with us over here at Polkadoodles and best of luck with your entry. "X" Marks the Spot !